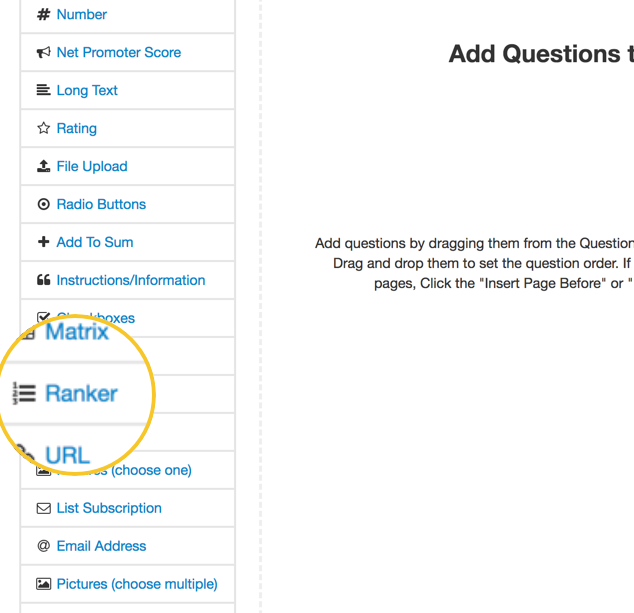 A ranker question types allow you to figure out the order of preference of different options. For example, you could ask customer to rank their preference of different types of products or services, or preference for colors. To illustrate this question type, we have created a question asking respondents to rank their favorite flavors of ice cream, 1 being the highest preference and 4 being the lowest. After filling this question out, SurveyTown will present you with a grid diagram. In the grid diagram, the higher the score the better. In the screenshot above "Vanilla" had the highest overall score of 3 with 3 people give it a 1 ranking, 6 respondents giving it a 2 ranking and 3 giving it a 3 ranking. Chocolate had more #1 rankings at 5, but it also had 5 respondents ranking it number 4 which brought down its overall score. The score is a weighted average. So in the case above you take the number of respondents that answered 1 and times it by 4 (since there are four options total) then you take the number of respondents that answer 2 and times it by 3, the number of people who answer 3 and multiple it by 2 and finally the number of people who answer 4 and times it by 1. You add all these up and divide by the number of responses to get the score. That's a Guide to the Ranker question type.